When you imagine a romantic dinner for two, crumbs never sully your partner’s face. 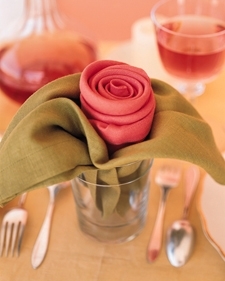 Give your fantasy a practical twist with napkins folded into a rose-inspired arrangement. The “flower” and “leaves” are tucked into a tumbler and set at each place setting. Don’t worry about making the corners meet perfectly — a little unevenness looks more natural. 1. 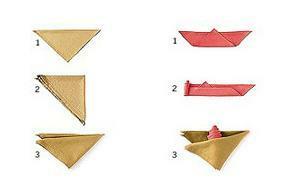 Fold a square green napkin in half along the diagonal. 2. Fold it in half again along the long edge. 3. Fold it once more in half along the long edge. 1. Use a square napkin of any color. Fold the cloth in half along the diagonal. Place it on your work surface so that the longest side of the resulting triangle is at the top. Take the corner opposite the longest side and fold it up so that it just extends over the top. The top and bottom edges should be parallel. 2. Fold the bottom edge up so that it falls just short of the top edge. Begin rolling the napkin from one end. Guide and adjust the cloth as you roll to give it an even shape. 3. Slip the completed flower between the upper and lower halves of the leaves, and arrange in the glass.